Launch Automator actions and script on your Mac from your iPhone (was Otto's Antenna). Is there a better alternative to Entangler? 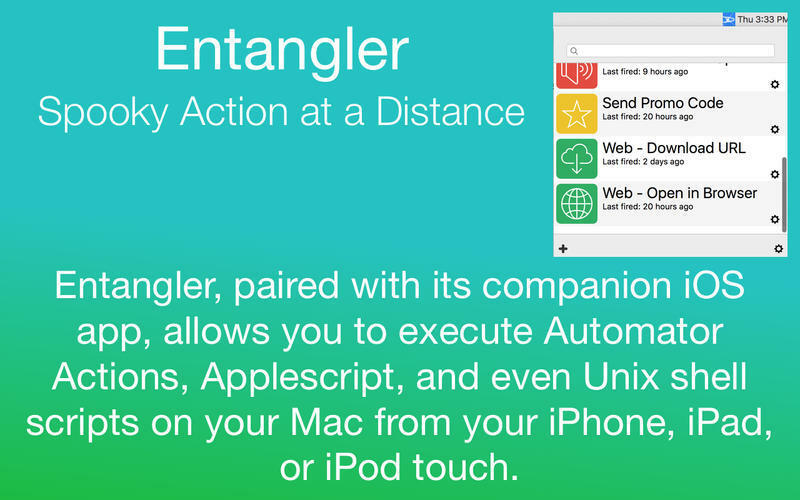 Is Entangler really the best app in Productivity category? Will Entangler work good on macOS 10.13.4? Remote control for your Mac. Launch Automator Actions, Applescripts, and even Unix Shell Scripts on your Mac from your iOS device, from across the room or across the globe. Integrate with your other iOS apps through X-Callback-URL and an Action Extension. Fire off these scripts from your Watch. Pass custom arguments to your scripts. An X-Callback-URL tool, making constructing X-Callback-URLs to launch scripts a breeze. Add ability to hide actions without deleting them. Add the ability to override an expiration time on an action (double tap or 3D touch the action). Actions can now be reordered. You can now optionally lock Entangler, requiring TouchID or FaceID to unlock it. A customizable action extension which allows you to relay data from apps on your phone to your scripts. You can now select actions to appear as Home Screen Quick Actions when you 3D touch the Entangler app icon.